- After a week of hiking solo it was time to hook up with my college roommate from my days at Quinnipiac University (Tom "Captain" Diaz) and his brother Chris. - Our original plan was to two a two day traverse of the Great Range but because of Thursday's awful weather we had to make changes on the fly while hiking. - We started off under very cloudy skies on the South Meadow Truck Trail, it started to rain about halfway to Marcy Dam so we slipped our rain covers over our packs. - We made good time to Marcy Dam where we took our first break and then hooked onto the Van Hoe Trail and started the long hike up to Marcy. - As we ascended the rain wasn't to bad until we arrived at the trail junction at Indian Falls when thunder and lightening started and it began to pour. We made quick decision to head for the Lake Arnold Trail junction. - We decided out best plan was to head towards the Feldspar or Uphill Brook Lean-to's and stay well below treeline considering the forecast called for worse storms early in the afternoon. - The Feldspar lean-to was taken by a couple and their two trail dogs, we weren't expecting to find anyone there on a wet and miserable Thursday morning! So we headed to the Uphill Brook Lean-to where two guys had stayed the night before but were heading out. This was a welcome relief for us as we would have had a soggy and miserable might out in our tents. - We waited out the second storm which was much worse and decided to head up the Mount Redfield and then Cliff Mountain. 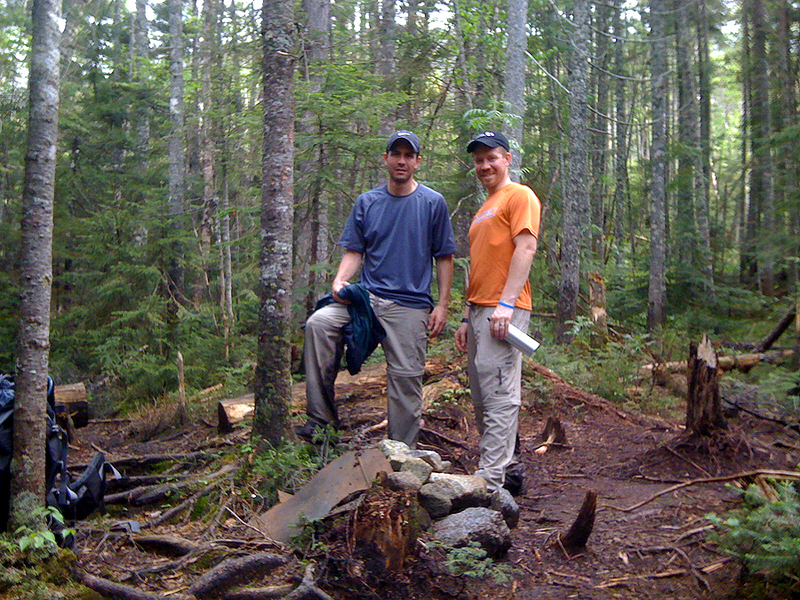 - The Mount Redfield herd path was my favorite "unmaintained" trail to hike so far in the ADK's. 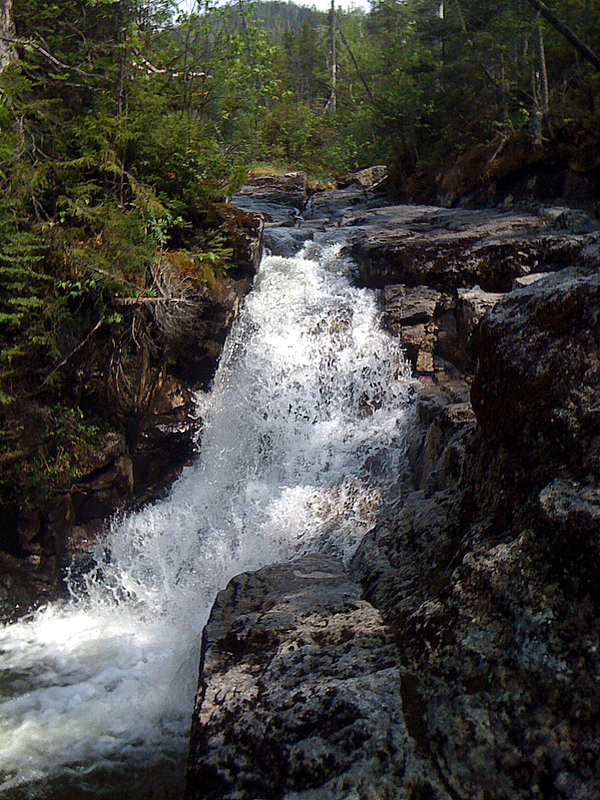 You ascend next to and up the Uphill Brook and it's falls. It reminded me of the Falling Waters Trail in the White Mountains except not as steep but more fun since you get to hike in the brook! - The skies were trying to clear up by the time we got to the summit, enough so that we could see Allen Mountain but not much more so we headed down. - At the cairn marking the split for Redfield and Cliff, Tom called it a day and headed back to the lean-to and Chris and I headed up the Cliff Mountain. - It was slow going at times as I have never have I experienced mud like this! If you didn't watch your step your boots would disappear a half foot to a foot into mud. - After the first muddy section we hiked up Cliff's Cliffs, which were a short steep fun section of scrambles below Cliff's false summit. - From here we dealt with one more atrocious muddy section before it was easy going dropping down and then heading up to Cliff's summit. Chris and I took a break for a few minutes and took some pictures before heading back to the lean-to. - At the lean-to we put on warm clothes and ate dinner as storm #3 rolled in and called it a night. - In the morning I started off ahead of the Diaz brothers so I could bag Gray and Skylight and catch up to them somewhere up on Marcy. They were skipping these to peaks to save their energy for Basin-Saddleback-Gothics later in the day. - Friday morning started off in the clouds and fog and the sun didn't burn them off until about 10am. Unfortunately this meant I'd get no views from Gray or Skylight and to make things worse everything was wet still and it was in the high 40's so it was not to pleasant of a morning. - The herd path up Gray was short and easy and the trail up to Skylight was just as easy and breaks above treeline for the last tenth of a miles or so. I'll definitely head back to both these peaks in the future to catch the excellent views that I missed. - When I headed back to the trail junction leading up Marcy luckily I noticed there were cobwebs between the fir branches crossing the trail so I knew that meant the Diaz's didn't get this far yet. - It was cold and my rainjacket was soaked on the outside and my perspiration had dampened the inside along with my layers and I was starting to get chilled so I put on dry clothes and stayed warm until Tom and Chris showed up. - As we headed up Marcy the clouds lifted and the views just kept getting better and better. I liked this final approach to Marcy more than the other side, it's a little more steep and fun especially with the heavier packs on. We stayed on the summit about twenty minutes and other than the summit stewardess there was no one else up there. - Next up was the hike over to Little Haystack. It went slower than it should have so I knew a hike over the rest of the Great Range would have to wait for another trip for the guys but even so we enjoyed the great views from Haystack and took a lunch break before heading down the the Haystack-Basin Col.
- When we got to Shorey's Short Cut we cut up and over and down to the Phleps Trail at Slant Rock as we started the long suffer-fest hike back to the Garden. - Tom was a little sluggish as a bad head cold came on and started to wear him down. At the Bushnell Falls Lean-to Chris and I divvied up most of the weight from Tom's pack to help him out and then set off again towards the Garden. - Unfortunately our original plan had us coming out at Rooster Comb so I set off ahead to get the car, It was a hellish final five miles to the Garden with more weight but I had not spills and my knees held up fine. At the Garden I dropped my pack and started down Johns Brook Lane to the car. I was not able to get hitch a ride as no cars came driving by but it only took about a half hour to get back to my car and thank god it was all down hill! - At the car I quickly changed and stretched before heading back to the Garden where the boys were waiting for me. 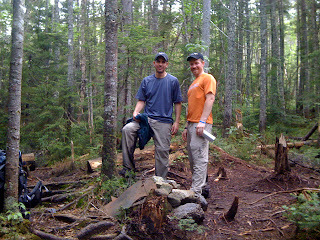 - It was a wet and wild two days in the ADK's but alot of fun to be out hiking with my friends. Eventhough we weren't able to hike our original planned trip we made the safe and smart choice on day one and were rewarded with a wicked fun hike up Redfield and muddy scrambling quick hike up Cliff which saved the day! - This ended my trip in the ADK's, I lucked out with outstanding weather for the most part and got in nine strait days of hiking in the high peaks. 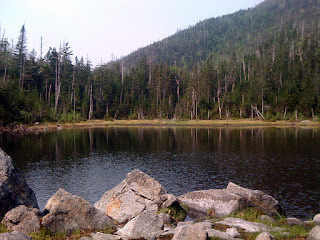 My goal was to try and hike close to 30 of the 46 high peaks over that time and I was able to get 31. I really enjoyed my first trip in the ADK's in twenty years and look forward to hiking the last fifteen peaks over the summer and fall!